The prophet Elijah is fleeing from Jezebel who is determined to kill him. In this painting he is asleep in the wilderness and an angel from God is bringing him bread and water. The angel seems to have just landed. His splendid wings are still extended. The prophet, his magnificently muscled body contrasting with the fluttering draperies of the angel, sleeps on as the angel looks down on him. 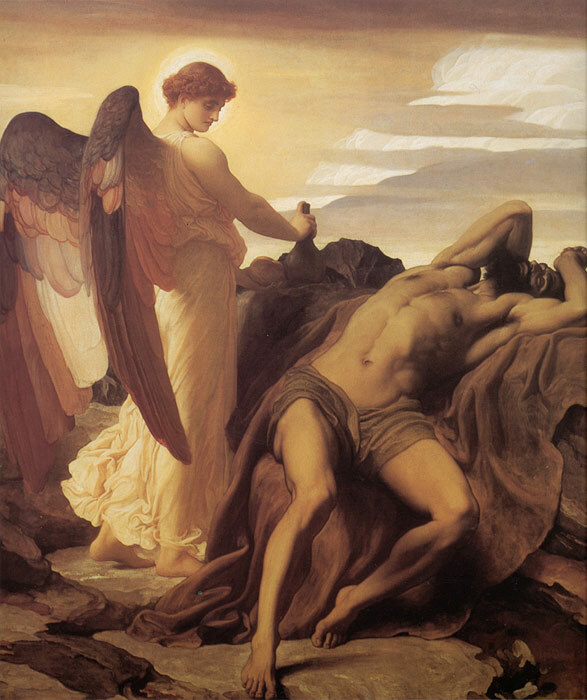 Lord Leighton was one of the most successful painters of the High Victorian era and Elijah in the Wilderness is one of his greatest paintings. SPECIAL NOTE : The painter will make the reproduction as close to the original oil painting as possible. If you want your painting to alter from this likeness, please email us and " Elijah in the Wilderness, c.1878 " will be reproduced according to your special requirements.